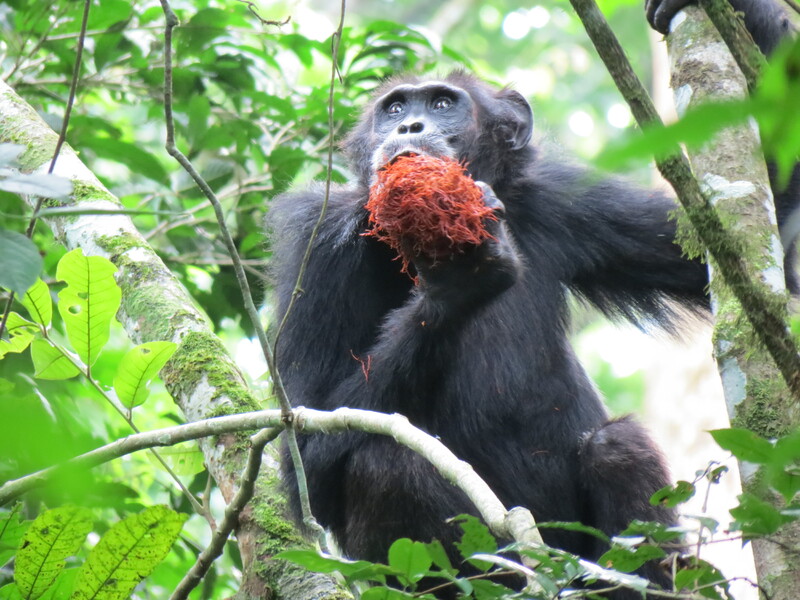 Posted on October 29, 2018 by Cristina P.
Cristina P. in Uganda on her Earthwatch expedition to BCFS. 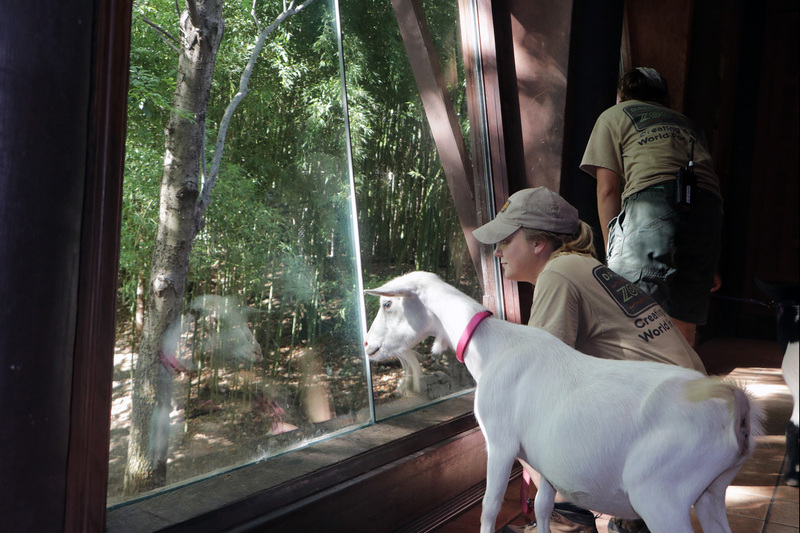 Primate keeper Cristina P. guest blogs on ZooHoo! In August of 2016 I received an unexpected call from the Dallas Zoo’s HR director. She informed me that I had been selected as one of the finalists for an Earthwatch Fellowship, and 9 months later I was on my way to an adventure I will never forget. Our group met up at a hotel in Entebbe, a city on the Northern Shores of Lake Victoria, 23 miles from the national capital Kampala, Uganda. We had only 5 participants in our team – 3 from Australia, one from Switzerland, and myself. Being in a small group allowed us to really form personal connections, and I am so grateful to have had the opportunity to meet people from around the world, including the great people of Uganda. Chimps gathered near our cabin in the forest. We left for the Budongo Conservation Field Station (BCFS), and 6 hours later we arrived to the most remote location I had ever been. The nearest town was 45 minutes away, I was not going to be in communication with anyone via phone or internet for the next 10 days, and primates were my new neighbors. I could not have been more excited. We were surrounded by groups of blue monkeys, red-tailed monkeys (also called guenons), baboons and black and white colobus. We saw many bushbucks (a brownish-red hoofed stock) as well as a few genets and civets at night. We heard the nightly calls of the tree hyrax. Birds were abundant in the area making it a great spot for bird watchers. The butterflies were the prettiest I had ever seen. BCFS has been around since 1990, and over the years, researchers have noticed that some of the fruit trees (which provide the chimps’ natural food source) have been producing drastically fewer amounts of fruit. The local villagers also believe that chimps and baboons have been raiding their crops more frequently. Could the decline of fruit availability be causing the increase in crop raiding? Could the fruit decrease be caused by global warming? Is this simply part of a natural cycle of the forest? The area had been exploited for many decades by the British for mahogany, so there’s also a theory that maybe as the forest regenerates and trees get taller, there is less sun getting through to the shorter fruit trees, thus affecting their development. BCFS tries to look at every piece of the puzzle, so many of the tasks we performed were for the purpose of furthering this research. One day we set up mist nets in the forest to catch birds and catalog them, since they are important in spreading seeds (they were released after we were done with measurements, banding and pictures). BCFS field assistants monitor types of leaves and fruit levels on around 1,400 fruit trees in the area, so we assisted in data collection for that project as well. 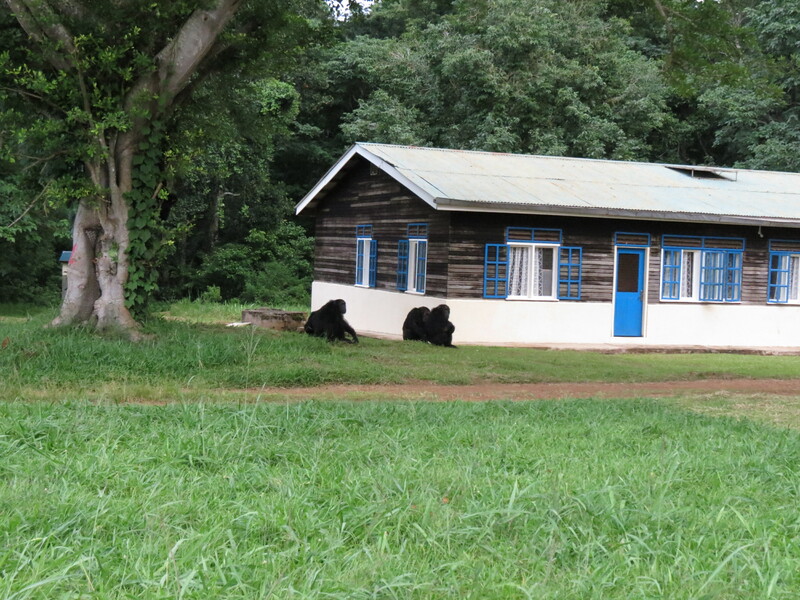 But most importantly, we observed 2 troops of chimpanzees, which was an experience like no other. 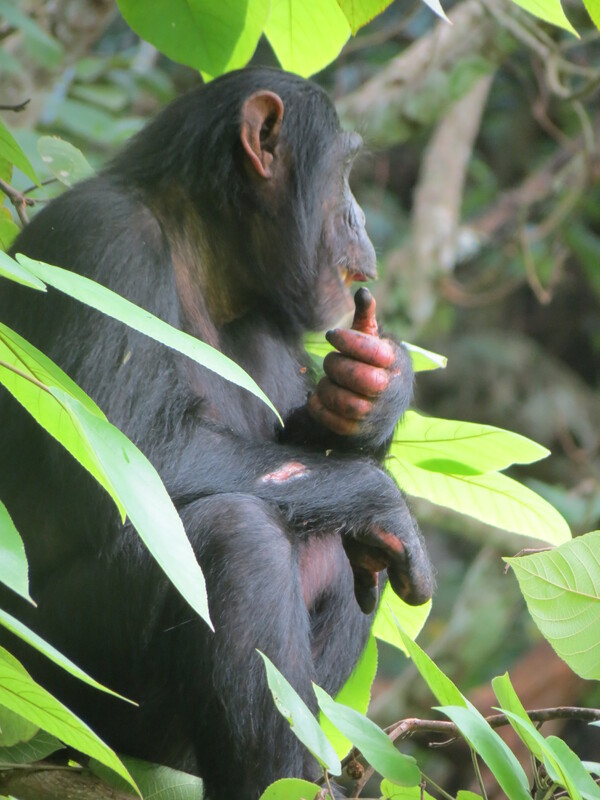 We observed this chimp enjoying a snack. 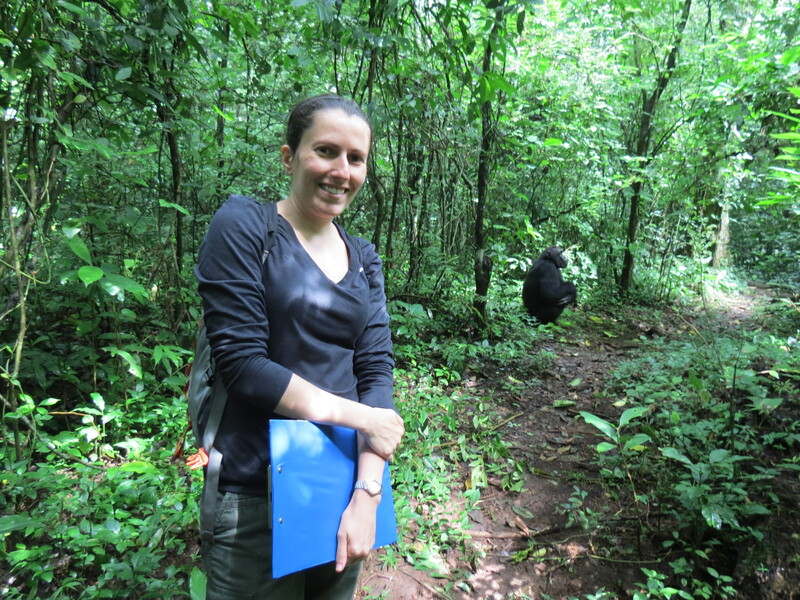 Some days, we’d start walking before dawn so we could find the chimps as they were waking up. One of the groups, called Sonso has been studied since the beginning of the project and is fully habituated, which means they see the people as part of their environment and do not mind human presence. The second group, Waibira, has been studied since 2011 and are still in the process of habituation. For the purposes of minimizing disease transmission and our safety we were told to keep a distance of approximately 23 feet to the chimps. The only problem with that was the animals don’t know that rule and at times came pretty close to us. It was fascinating to be so close to an animal that is so strong and powerful, yet they seemed to just go about their day as if we weren’t even there. A chimp is observed with injuries from being caught in a snare. We also had the chance to assist the snare removal team. In this particular area, chimps are not hunted for bush meat. Instead the targets are bush pigs, blue and red duikers, and bushbucks. Unfortunately though, chimps inadvertently get caught in those, and about 25% of the animals in this area have a snare-related injury. One particular female had gotten caught by a snare 3 different times! They have even been observed trying to free one another from the snares. It was also noted that there was no difference in how the injured chimps were treated by their troop and they seem to eventually adapt to their new reality of missing fingers, toes, etc. Unfortunately some are not so lucky and do end up dying from their injuries. Occasionally the BCFS veterinary team will sedate an injured chimp and remove a snare if the animal is left behind by its troop. On one of our last days we visited a nearby village to interview the local farmers and learn about the impact that chimps, baboons, and small monkeys have on their crops. Years ago, BCFS helped them identify what kinds of foods would be least appealing to the animals and provided them with seeds, which were then planted near the forest edge. They do this in the hopes that the animals might keep walking further out to search for foods they like better. The farmers depend on these crops, not only for income, but also to feed their families. Leaving BCFS was bittersweet. I still miss seeing the chimps and all the people I met! But since I’ve returned from Uganda, I have a renewed hope that there are people out there doing amazing things every day to save these animals from extinction. 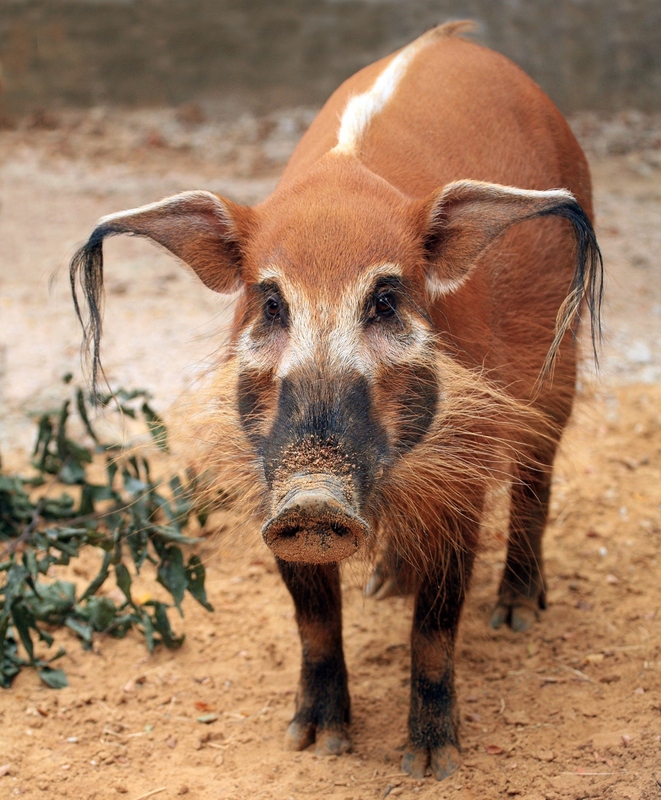 With heavy hearts, we announce that 15-year-old red river hog Hank passed away due to T-cell lymphoma. 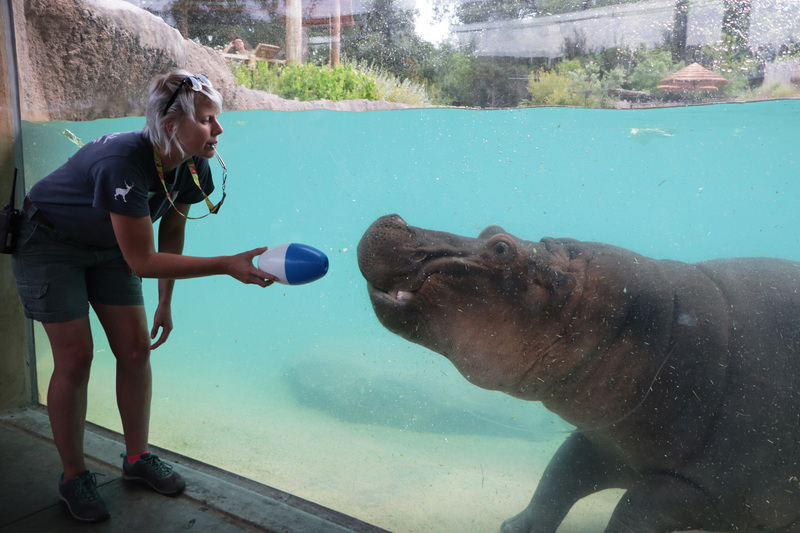 Hank was loved by our animal care staff and guests alike, and will be greatly missed. Hank was loved by many, and will be missed. In January of 2017, routine bloodwork showed that Hank’s white blood cell count was extremely elevated. After further testing, he was diagnosed with T-cell lymphoma – a type of cancer that begins in immune system cells and affects the lymph nodes. Hank was moved to a special area behind the scenes where he could be more comfortable during his oral chemotherapy treatment. Chemotherapy can cause some negative side effects, but Hank thankfully displayed none and continued to be a happy and active hog during his nearly two years of treatment. He even enjoyed going out into the exhibit with his friend, Zena, at least once a week for a few hours, before returning to his enclosure behind the scenes for an afternoon nap. Our dedicated animal care staff worked very closely with Hank during his illness. In addition to his treatment, keepers saw to it that he had plenty of enrichment and training activities to encourage his natural behaviors and keep him mentally stimulated. Mulberry logs were his favorite. Keepers say that he would spend hours chewing all of the bark off of them. Animal care staff members spend a lot of their day behind the scenes, so Hank received lots of love and attention. He particularly enjoyed getting belly scratches, which keepers were always happy to give. Prior to Hank’s treatment, there was very little information available about using chemotherapy to treat hogs with lymphoma. Our veterinary staff were unsure what to expect, but because they chose to proceed with Hank’s treatment, we were able to give him nearly two more years of happy and enriched life following his diagnosis. 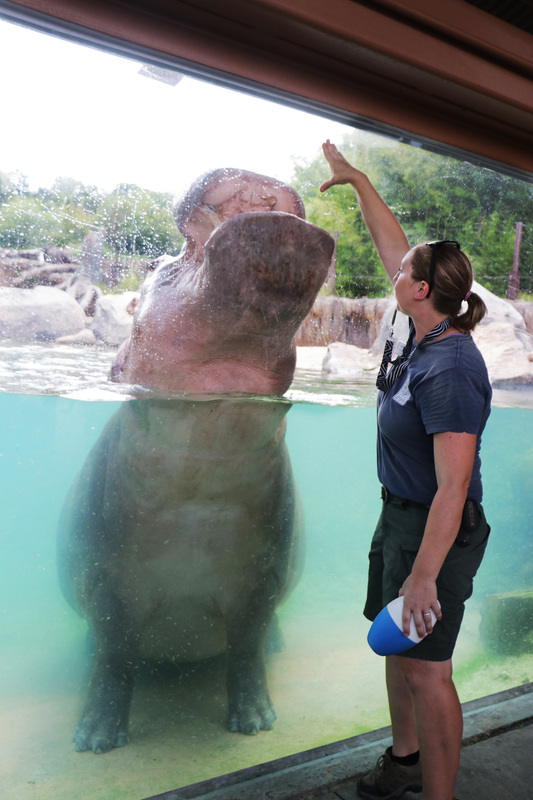 Veterinary staff gathered significant information during Hank’s treatment that could potentially help other animals in the future, here at the Dallas Zoo and elsewhere. 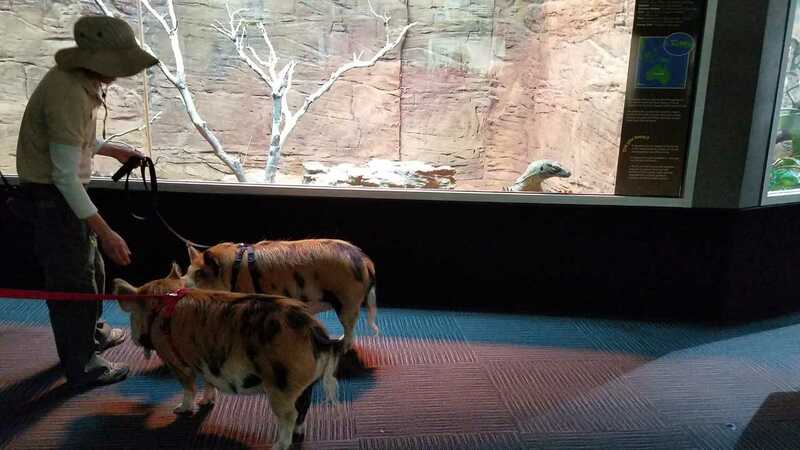 “I worked with Hank at my last zoo. Every time he heard a tractor come by, he would run and vocalize with excitement. And, when approached would immediately lay down for scratches. He greeted me with that same excitement, every single time!“ – Tanya B. “If you just lightly touched his belly while he was standing, Hank would tip over like a tree falling and lay there waiting for belly rubs. I also loved to push his pine shavings into a giant pile and watch him bury himself completely in them when he went to bed. “– Jessi V.
“Hank used to run laps around his habitat. When he finally completed the behavior you’d see him sprint around the corner to the ‘finish line’ with his ear tassels just flying in the wind. In that moment, he seemed like the happiest hog on earth.” –Christina E.